This was a lovely salad. 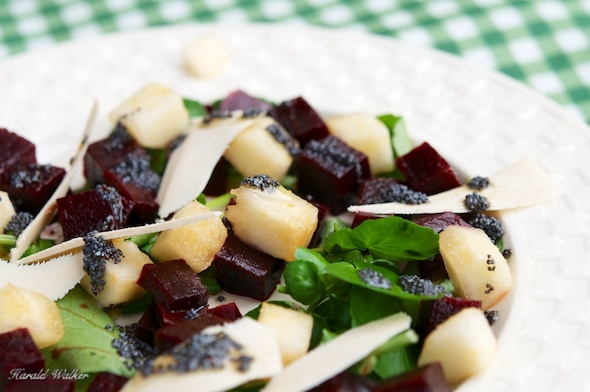 Beets and pears go really nicely together and the poppyseed dressing is great. Clean and peel the beet. Cut into cubes or slices as desired. Place in a saucepan and cover with water and a pinch of salt. Cook the beets until soft. Place the ingredients in a small salad carafe. Pluck the leaves from the larges stems and arrange on salad plates. Peel the pears, remove the core and cut into cubes or slices as desired. Arrange the beets and pears on the watercress. Slice or grate the soy chess over the salad. Drizzle the salad dressing over and serve. 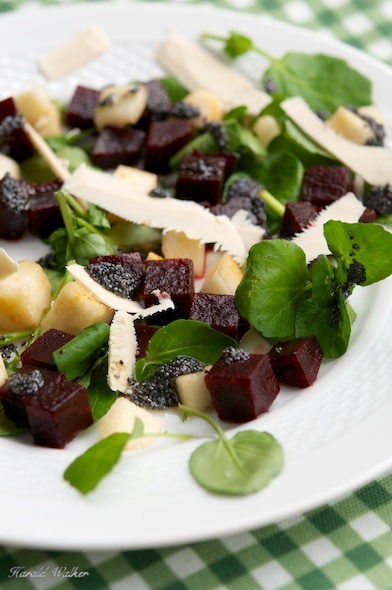 Posted by Chris Walker on September 29, 2012 in Beet, Pear, Salads, Soy cheese, Watercress.